Steakhouses are like churches for meat-loving Americans for, indeed, the love of steaks can take on near-religious proportions. The likes of Ruth’s Chris Steakhouse and Morton’s Steakhouse have an enduring popularity for this reason. But which one is better? Founded in the 1960s as a casual dining restaurant, Ruth’s Chris Steakhouse has undergone many changes in its menu, prices, and atmosphere. Such are the changes that it’s now among the country’s better-known upscale steakhouses, a far cry from its casual dining days. With more than 100 locations across the country, as well as several more abroad, it’s a steakhouse chain that caters to the steak-loving population and more! Let’s first teal about the quality of its steaks, as befitting a steakhouse. Every steak that comes out of its kitchen is made of USDA prime meat, the highest grade. The meat then has the perfect balance between lean meat and fat, aside from being as fresh as possible. Such choice results in a more succulent, tenderer, and juicier steak, if and when it’s cooked properly. The Ruth’s Chris method of cooking beef ensures that the steak comes out as delicious on the mouth as it appears on the plate. The meat is first seared at a high temperature and then topped with a tablespoon of butter, which makes the steak feel silkier and taste juicier in the mouth. The steaks come in generous portions, too, so many diners don’t even bother ordering many other dishes. But for those who have a prodigious appetite, the Ruth’s Chris menu is quite extensive. There are plenty of entrées to choose from including fish, chicken and lamb, as well as lobster and shrimp, all of which are prepared by trained chefs. There are also several side dishes, starters, and desserts as befits a full-service, fine dining restaurant. Many of the dishes can be ordered in either individual servings or family-friendly sizes. The prices are, as to be expected, more expensive than you would find in a casual dining restaurant. But since you’re getting a classy ambiance, professional table service, and delicious food and drinks, the upscale prices are a minor matter. Take note that every Ruth’s Chris restaurant has a dress code, either business casual or business dressy. Many locations are open only for dinner service while some serve both lunch and dinner. Like Ruth’s Chris Steakhouse, Morton’s Steakhouse is also an upscale chain of steakhouses. With more than 70 locations in the United States and abroad, it’s smaller in size than Ruth’s Chris but this isn’t a case of David vs. Goliath. Each chain has its loyal patrons and we have to say that both have their merits. “The Best Steak, Anywhere” This is the Morton’s Steakhouse motto and, fortunately, the chain is doing a great job living up to its own hype. 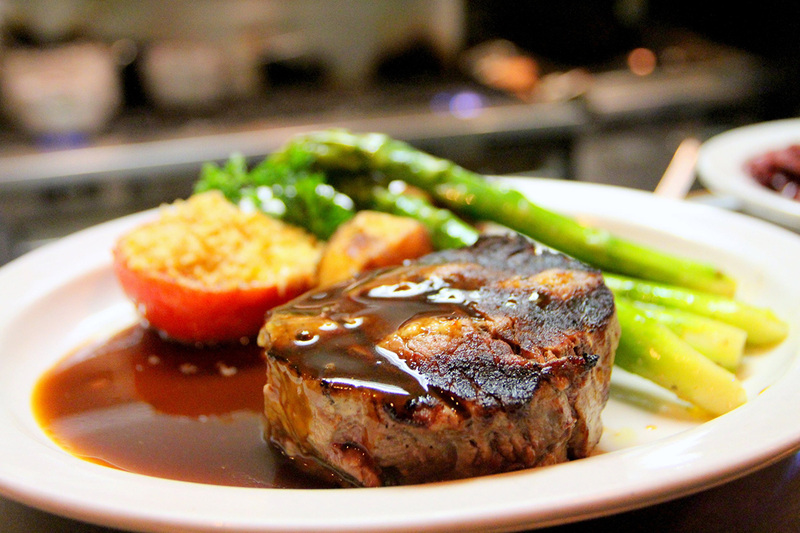 The steaks are made from prime USDA steak, as well as aged before being grilled. These are among the best-tasting steaks in the country – beefy, tender yet with a slightly chewy texture, and delicious with its flavorful, juicy and succulent quality. The steaks also come in generous portions, whether you ordered the sirloin or the rib-eye, so it’s possible to share your steak with others or, like many of us, be selfish and eat everything, except the bones. We loved that the steaks come the best parts of the cow, too, such as the porterhouse, the rib-eye, and the bone-in so we don’t feel shortchanged for the money we paid for them. The menu isn’t limited to steaks although most customers come to Morton’s for them. There are also several appetizers, such as the oysters Rockefeller, the Colossal Shrimp Alexander, and the bacon-wrapped scallops, as well as several more entrées, main dishes, and desserts. Morton’s is a full-service restaurant so enjoying full meals is possible here. In comparison with Ruth’s Chris, the overall vibe at Morton’s Steakhouse isn’t as upscale. We daresay that the latter has a more generic vibe that can be seen in many other steakhouses. But what Morton’s Steakhouse falls short in elegant décor, it definitely makes up for in the attentive, friendly and efficient service of its waiters and managers. Of course, Ruth’s Chris is just as excellent when it comes to customer service. But since it has a more upscale vibe, the waiters tend to be more formal, a good thing when you’re bringing in guests to impress them with your choice in a steakhouse. So, which one is better? Well, it depends on your personal preference and agenda. If you’re going for an upscale yet more relaxed ambiance, then Morton’s Steakhouse may be your best choice. If you want a more formal vibe and gourmet food, then Ruth’s Chris is the way to go. You will agree, nonetheless, that both steakhouses serve the best steaks this side of the world! In the end, the steaks are the most important thing.